When you need to take complete control over your workflow in the studio or on stage, you need the best MIDI keyboards that offer a world of versatility and dynamic response. There’s a load of different options out there, but there are a select few that we feel qualify as contenders for best MIDI keyboards of all time. So today, we’ve rounded up 7 of the best MIDI keyboards and MIDI keyboard controllers that are perfect for musicians of all levels. The Roland GO:Keys GO-61K Digital Keyboard is an easy to use, and most importantly a fun keyboard to create music with. Straight out of the box you get a 61-key keyboard with ivory feel, velocity sensitive keys – ideal for those who know their way around a keyboard. However, if you’re just starting out playing, or you’re a musician who doesn’t play the keyboard as their main instrument, you’ll appreciate the intuitive Loop Mix function which allows you to trigger loop phrases relative to the note you hit. The on-board performance pads allow you to change parameters such as pitch and use filters where you need them. This is also packed full of immediately accessible sounds that everyone from beginners to pro level players will enjoy – 500 sounds to be exact! Best of all, these 500 sounds are derived from Roland’s acclaimed pro synthesizers, so you've got a massive selection of world class sounds at your fingertips. The Bluetooth streaming function also allows you to stream your music or backing tracks via your smartphone or tablet, whilst the fact you can power the keyboard via 6 x AA batteries means you can create music anywhere anytime. The Native Instruments Komplete Kontrol A49 is one of the best MIDI keyboards on the market today building on the success of the "S" series, offering superb control and functionality for music producers of all genres and levels. Straight out of the box you have a streamlined keyboard controller that can control all your virtual instruments and effects via the integrated semi weighted custom NI keybed, 8 x touch-sensitive control knobs and ergonomic pitch and mod wheels. This feels incredible and really brings out the best in your playing. You do get a full suite of Native plug-ins included such as Kontakt 6 Player, Reaktor 6 Player, Maschine Essentials, The Gentleman (Piano) and many more, so you’re good to go straight out of the box. However, you can also easily integrate the Komplete Kontrol A49 into your existing workflow and it will automatically map to your DAW and plug-ins. In fact, there’s auto-mapping for hundreds of NKS-compatible Plug-In manufacturers like Rob Papen, Spectrasonics, Arturia and many more. It’s USB 2.0 bus powered, can be assigned as a MIDI controller for your existing hardware and allows for instant song creation via the 100+ mapped scales and modes. This is an impressive song writing tool all musicians will enjoy. If you need a highly portable MIDI keyboard with a small footprint that still retains a high level of functionality, the M-Audio Oxygen 25 4G USB MIDI Keyboard is one of the best MIDI keyboards around. This is a highly reliable and versatile MIDI keyboard and production tool that features 25 full size velocity sensitive keys, 8 velocity sensitive trigger pads and 8 assignable knobs that allow you to manipulate and trigger your virtual instruments, plug ins and effects. We think this is one of the best MIDI controllers as it reduces your reliability on a mouse and puts the control back in your hands via the transport buttons as they can be used to control your DAW - great for live applications. The DirectLink functionality makes working with your DAWs a breeze as it automatically maps controls to a huge range of popular DAWs including the likes of Ableton Live, Pro Tools, Logic, Cubase, and more. If you’re just starting out in the world of music production, you’ll appreciate the fact you get Pro Tools First included as well as Touch Loops’ 2GB sample library and VIP 3.0 software so you can start creating and recording music straight away. Whilst we’re on the subject of portable music production, we have to discuss the Akai MPK Mini MK2 USB MIDI Controller, which is one of the best MIDI keyboards for those with limited room and those who want to be able to create music on the fly. This is small enough to fit in your backpack and light enough to carry alongside your laptop without compromising on functionality or control over your workflow. Best of all – it’s USB powered, so there’s no batteries or adaptor to cart around with you. You have 25 synth-action mini keys as well as 8 MPC pads with Note Repeat, 8 assignable control knobs as well as a new 4-way thumbstick for dynamic pitch and modulation control. We love this MIDI keyboard as it not only provides expert control over your sounds, but comes complete with a massive selection of production software such as MPC Essentials, Twist from SONiVOX and VIP 3.0 – to name a few! The Akai MPK Mini MK2 can easily be integrated into your existing workflow and communicate with your DAW and sequencer, too. It’s plug-and-play technology made easy. At under £75, it’s also an extremely budget friendly option too. Well, we can’t have the best MIDI keyboards blog without the Novation Launchkey 25 MK2 USB MIDI Keyboard can we?! This nifty piece of kit is an extremely useful MIDI keyboard and one of the industry standard options relied upon by professional musicians everywhere. If you’re an Ableton Live user, this is the MIDI keyboard for you as it is designed to provide immediate control over your session view, instruments, effects and mixer via the 25-note synth-style keyboard, 16 pads and 8 hard wearing knobs. The cool thing about the full colour RGB LEDs is that they’ll match the colour of your clips so you know exactly where you are at all times whilst performing or recording. They’re also velocity sensitive so you can really throw some feeling into your beats. 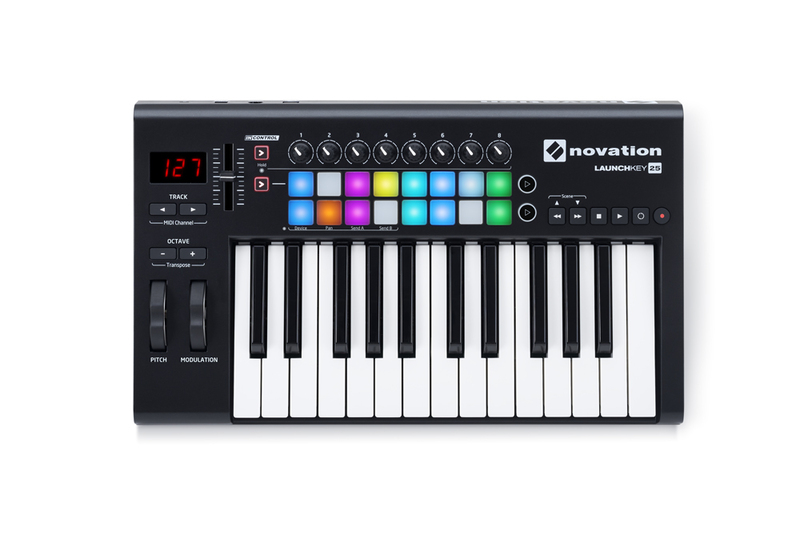 You can control all major music software with this MIDI keyboard, so you can add it to your existing workflow with ease or take full advantage of the included music software such as Ableton Live Lite, Novation Bass Station and V-Station virtual instruments along with 1GB of samples from Loopmasters. The Arturia KeyLab Essential 61 MIDI Keyboard is yet another MIDI keyboard controller that focuses on one major ingredient of music making – fun! The Arturia KeyLab Essential 61 offers extensive control over your DAW as it maps effortlessly to your existing set up and to the included software. In this bundle you get Arturia mini V, Stage-73 V synths, plus Analog Lab (6500+ sounds), Ableton Live Lite, and UVI Grand Piano Model D making it an impressive option for those just starting out too – it’s everything you need to make music! Its dedicated DAW Command Center has been designed for quick access to the most commonly used functions whether you’re mixing tracks or recording live. For this reason, we believe it’s one of the best MIDI keyboards by far. A slick design encourages a positive playing experience as you have 61 velocity and pressure sensitive pads with RGB backlighting, as well as 9 rotary and fader knobs which provide superior dynamics and even more control. This is great to play when recording or using in a live scenario. Thanks to the amount of software included, you can not only start to record straight away, but you can access hundreds of world class plug-ins sounds and instruments as soon as you’ve installed the software. It’s USB powered so there’s no need for adaptors and batteries either. A portable powerhouse! One thing that the ROLI Seaboard RISE 49 Keywave Controller Keyboard has over other MIDI keyboards is superior expression and dynamic capabilities. This thing is like an extension to your fingers offering fluid response that effectively lets you glide from key to key and slide notes up and down without having to move from the key. The Seaboard RISE 49 actually provides its signature Five Dimensions of Touch known as Strike, Glide, Slide, Press and Lift. These 5 different aspects offer something that other keys simply cannot. The Strike responds to the velocity and force with which you make contact with a keywave, the Glide responds to the horizontal movements across the keywave whilst the Slide responds to vertical movements of your finger. Furthermore, Press responds to the continuous pressure after the initial strike a whilst the Lift expertly responds to how fast or slow you liftoff from the keywave. The ROLI seaboard responds exactly how you want it to. We think it’s one of the best MIDI keyboards as it sets a completely new standard in terms of expression and playability and thanks to the Bluetooth connectivity which transmits MIDI wirelessly, the bespoke soft case, the hardwearing material and the fact the USB rechargeable internal battery supports up to 12 hours of wireless play it’s also completely portable. It’s Windows and iOS compatible and can work with a wide range of DAWs including those on an iPhone and iPad, too – machining it a must have for musicians who use a variety of different hardware or operating systems to create music. Check out this clip from the film La La Land, John Legend – ‘Start a Fire’. Ryan Gosling’s character uses a ROLI Seaboard RISE to create those really cool sounds. Shop a full range of MIDI keyboards over at PMT online today or call in to your local PMT store to speak to our experts about the best MIDI keyboards for your needs. We’re here to help and can help you get the right option for your musical endeavours.